Is your dog or puppy shy and leery of people; afraid of strangers, certain situations or objects? It is natural for some dogs to be shy of things that are new and unfamiliar. During development, a dog becomes socialized with familiar people, animals, objects and situations. But they will still tend to shy away from the unfamiliar. Shyness in itself is not a problem. It is only a problem if the dog's shyness inhibits your lifestyle or if the dog develops other problems related to shyness such as fear biting. Shy dogs often bolt when frightened, endangering themselves by running blindly into danger, such as traffic. In a well meaning attempt to calm their dog's fears, many people end up actually reinforcing the dog's shy behavior. In effect, the owner inadvertently trains the dog to be more fearful. Be careful not to reinforce your dog's fearfulness by offering reassurance. When our timid dog hides, barks defensively, whines, screams or snaps, our response is only natural. Our protective instincts cause us to reassure the dog by talking soothingly, petting or even picking up the dog for a hug. These actions flagrantly reward the dog for fearful behavior. It is best to just completely ignore your dog when he acts fearful. Let him learn by his own experience that there is nothing to be afraid of. Save your praise and reassurance for times when your dog acts with confidence. Many people try to rehabilitate their dog too quickly, forcing him to socialize with other dogs and people. This usually reinforces the dog's view that other dogs and people are frightening. On the one hand, the dog needs to be socialized as quickly as possible, but on the other hand, he should not be forced into it. If you push your dog to do too much too soon, your dog will only become more fearful and may be forced into a situation where he feels he must defend himself. Socializing a dog and helping him build his confidence is a time consuming task. Thrusting him into the arms of every visitor and dragging him out to socialize with many other dogs can be counter-productive. Strangers should never be allowed to approach your dog to pet him. It should always be left to your dog to make the first contact. If your dog does not want to approach, that is OK. Just give him plenty of time to 'hide and peek' and eventually he will come out of hiding. 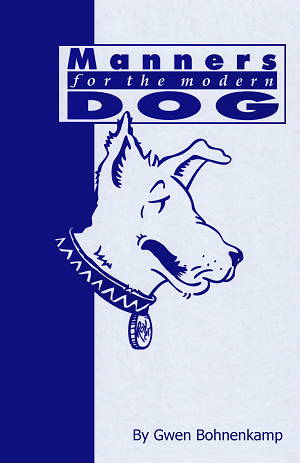 It's up to you to provide ample opportunity for socialization, but it is up to the dog to proceed at his own pace. Don't verbally try to encourage him out of hiding. He will probably interpret your encouragement as praise for hiding. Don't try to force him to come out, this will only frighten him even more. Shy or fearful dogs can react defensively when approached by unfamiliar people. They may try to keep strangers away by growling, snarling or snapping. These behaviors must not be ignored. No dog should be allowed to get away with acting aggressively towards humans. The fact that your dog is shy is no excuse to condone growling or biting. You must instantly and effectively reprimand such behavior. As soon as your dog stops acting aggressive, it is essential that you praise him. We do not want your dog to think that the presence of the stranger brings on the reprimand, but that his own obnoxious behavior causes you to get angry. If it is ever necessary for you to reprimand aggressive tendencies in your shy dog, you have probably been trying to push him along too quickly. Avoid similar threatening situations until your dog has developed sufficient confidence to deal with them without resorting to aggression. Do not allow strangers to reprimand your fearful or shy dog. For more detailed information on handling fearful and/or aggressive behavior in dogs, please read HELP! MY DOG HAS AN ATTITUDE. 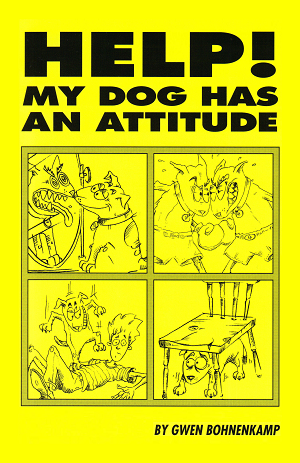 This book covers the causes, cures and prevention of attitude problems in the pet dog. The exercises given show how to build mutual trust and respect between owner and dog. The methods use confidence building, desensitization, and reward training.